Google announced its plans to support podcasts in Google Play last October, and now it appears that the feature is ready to launch. A handful of users are reporting they’re seeing the new Podcasts section pop up in their Google Play Music app’s left-side navigation menu, underneath the section for Top charts, New releases, and their Music Library. This is clearly not a wide-scale rollout at this time, as most still do not see the Podcasts section. 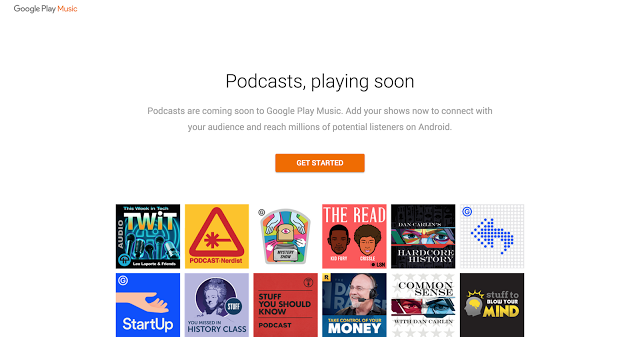 Plus, Google has not yet made a formal announcement about the launch, which it is likely to do when podcast support is live for the majority of users, or soon being switched on. However, for those who do have access to podcasts, they describe it as looking much like the rest of the Play Music app, with a card-style layout and orange color scheme. One tipster told the Android Police blog that the show’s pages also include their artwork, and a clickable “play” button as well as options to subscribe, share the show, or view a list of episodes. Users say that when you subscribe, you’re asked if you want to download the last five episodes and be notified about new releases. Meanwhile, while listening to shows, you have the option to click on buttons that rewind the show back by 30 seconds or skip ahead. One notably missing feature is the option to vary the podcast’s speed – a tool that power users often rely on when listening to educational audio programs, where it’s more about absorbing the information, and less about leisurely enjoying the show. It’s somewhat incredible that it has taken this long for Google to support the popular entertainment genre in its Music service, a rival to Apple’s iTunes. However, Google did promise that it would offer a unique spin on podcast recommendations. Last fall, the company said that it would connect new listeners to shows based on what they’re doing, how they’re feeling, or other interests, similar to its contextual playlists for music. It’s unclear if or how this has been implemented in the section that users are seeing now, as the interface itself appears to be a pretty basic, two-tab affair – there’s a section for Featured podcasts and another for Your Podcasts. Users can also search or browse to find other titles. The news of the section going live for some comes on the heels of an accidental leak about the timing of the podcast platform’s launch. We’ve asked Google if it can comment on the status of the rollout, given these reports, and will update if a statement is provided. Update: Google declined to comment. 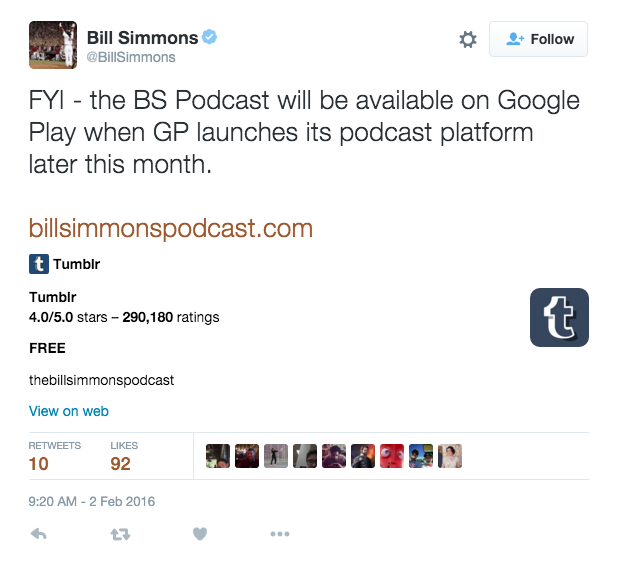 However, we’ve now confirmed that Google has not yet officially launched podcasts, despite what’s being spotted in the wild.